Got Game? Register Online Today for These Camps! 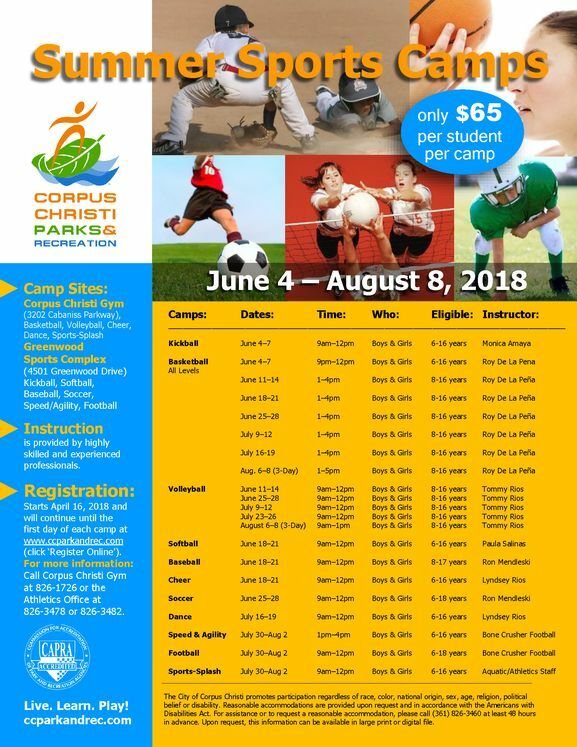 CORPUS CHRISTI, TX - The Corpus Christi Parks & Recreation Department is now accepting registration for its 11 different Summer Youth Sports Camps that will be held from June 4 to August 8, for boys and girls ages 6 -18. These camps take place in safe, fun and supervised settings at Corpus Christi Gym (3202 Cabaniss Parkway), and the Greenwood Sports Complex (4501 Greenwood Drive). In addition to the long-running camps which include Basketball, Baseball, Softball, Soccer, Football, Volleyball, Cheer, Dance, Speed & Agility, we are excited to offer two news camps this year which are Kickball and Sports-Splash. These camps introduce children to the fundamental skills of the different sports and instruct them on how to play each game. Through targeted skills training and practice using strategies and plays, experienced players will sharpen their skills to advance their overall game. All of our instructors are highly trained and experienced professionals with a passion for their sport who are dedicated to instilling structure, discipline, teamwork, sportsmanship and fair play in our youth. ONLINE REGISTRATION is open now until the first day of each camp at www.ccparkandrec.com (click ‘Register Online’). The cost is $65 per camp per youth. For more information, call the Corpus Christi Gym at (361) 826-1726 or the Athletics Office at (361) 826-3478 , or visit www.ccparkandrec.com (click ‘Sports’). NEW: Kickball Camp with professional instruction by Monica Amaya for boys and girls ages 6-16 will be offered on June 4–7 from 9am–12pm. Basketball Camps (seven camps) with professional instruction by Roy De La Peña will be offered for boys and girls ages 8-18 of all levels as follows: June 4–7 from 1–4pm, June 11–14 from 1–4pm; June 18–21 from 1–4pm; June 25–28 from 1–4pm; July 9–12 from 1–4pm; July 16–19 from 12–4pm; August 6–8 from 12–4pm. Volleyball Camps (five camps) with professional instruction by Tommy Rios for boys and girls ages 8-16 from 9am–12pm on the following dates: June 11–14; June 25–28; July 9–12; July 23–26; and August 6–8. Baseball Camp with professional instruction by Ron Mendleski for boys and girls ages 8-17 will be offered on June 18–21 from 9am–12pm. Softball Camp with professional instruction by Paula Salinas for boys and girls ages 6-16 will be offered on June 18–21 from 9am–12pm. Cheer Camp with professional instruction by Lyndsey Rios for boys and girls ages 6-16 will be offered on June 19–22 from 1–4pm. Soccer Camp with professional instruction by Ron Mendleski for boys and girls ages 6-18 will be offered on June 25 –28 from 9am–12pm. Dance Camp with professional instruction by Lyndsey Rios for boys and girls ages 6-16 will be offered on July 16–19 from 9am–12pm. Speed & Agility Camp with professional instruction by Bone Crusher Football for boys and girls ages 6-16 will be offered on July 16–19 from 1pm–4pm. This camp is designed to enhance the players' speed, agility, running mechanics (technique) and explosive power through dynamic and acceleration workouts, along with stretching and calisthenics. Football Camp with professional instruction by Bone Crusher football for boys and girls ages 6-18 will be offered on July 16–19 from 9am–12pm. NEW: Sports-Splash Camp with professional instruction by City Athletics and Aquatics program staff for boys and girls ages 6-12 will be offered on July 30–August 12 from 9am–12pm. Campers will start each camp day by choose from a variety of non-completive sports, games and activity stations, then DIVE IN FOR SOME FUN, recreational swim!